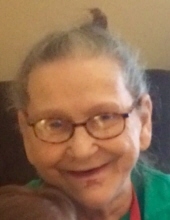 Ruth L. Faust, 81, of Merrill, passed away Thursday, March 28, 2019 at Pine Crest Nursing Home, Merrill. Ruth was born April 11, 1937, in the Town of Skanawan, Lincoln County, daughter of the late Gustaf and Rose (Fish) Sandberg, Sr. She married William ‘Bill’ Faust. He preceded her in death. Ruth had worked at the former Skipper’s Restaurant in Merrill. She enjoyed visiting with her nieces and nephews and taking care of her cats. Ruth is survived by her sister-in-law, Connie Sandberg of Schofield; nieces and nephews, Cindie (Clarence) Daniels of Weston, Sherree (Dale, Jr.) Taves of Mosinee, Mike Sandberg of Mosinee and Jeff Sandberg of Marshfield; and several great-nieces and great-nephews. Ruth was preceded in death by her husband, Bill Faust; her parents, Gustaf and Rose Sandberg, Sr.; and brothers, Eddy Sandberg, Forest Sandberg, Oliver Sandberg, and Gustaf Sandberg, Jr. In accordance with Ruth’s wishes, there will be no services. The Taylor-Stine Funeral Home & Cremation Services, Merrill, is assisting the family. Ruth’s family would like to thank the staff at Pine Crest Nursing Home, Merrill, for the care and compassion shown to Ruth and her family. To send flowers or a remembrance gift to the family of Ruth L. Faust, please visit our Tribute Store. "Email Address" would like to share the life celebration of Ruth L. Faust. Click on the "link" to go to share a favorite memory or leave a condolence message for the family.